Sponsored Post. 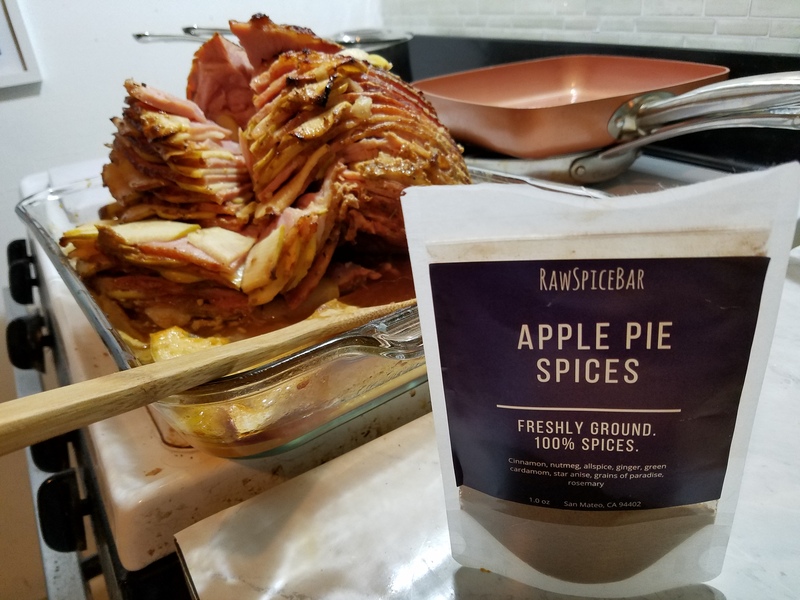 I was asked by RawSpiceBar to develop a new recipe using their Apple Pie Spices mix. While most would instantly think of a dessert, I knew that would not work for me. I am not the kind of person that usually makes desserts. 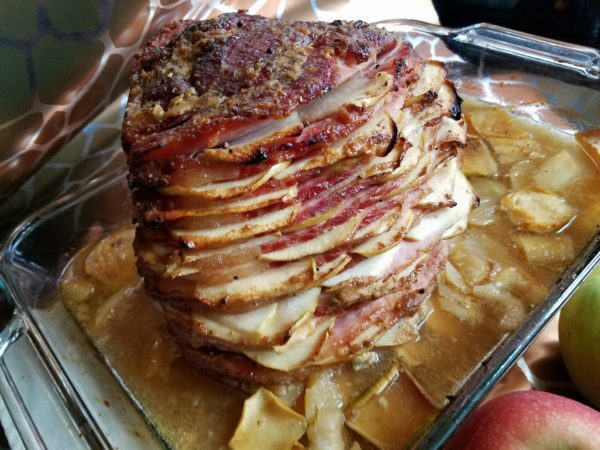 So I thought about it and came up with Apple Spiced Ham. My logic was if we can put pineapple on ham, then we should be able to use apples! And boy, was I right about that. The result? This is by far the best ham I have ever had. And the apple gravy…*eyes rolling into the back of my head*…was so good it needs to be bottled up and sold in markets everywhere. Since this is also apple season, this recipe works perfectly for the time of year. When choosing apples, make sure to use apples that will hold up while cooking. I used Granny Smith and Empire apples. Other apples that work well: Golden Delicious and McIntosh. The key ingredient here that you cannot skip is the Apple Pie Spices mix from RawSpiceBar. This is one of the most important ingredients in the entire recipe. This is what adds the extra oompf to the entire dish, making the ham and the gravy go the extra mile. For those who end up with leftovers, I recommend using this in every leftover ham recipe you can think of…including the apples. I added the ham and apples to bean soup, pastas, scrambled eggs…and to tell you the truth, I never knew the apples were there. I hope you enjoy this recipe as much as I did. Let me know in the comments if you tried this and what you thought of it. A twist on the classic ham recipe. Preheat oven to 350 degrees Fahrenheit. Meanwhile, start with the apples. Cut the apples into quarters and de-core them (remove seeds and ends, no need to peel the skin). Using a mandoline, thinly slice 2-3 apples (depending on the size of your ham). Reserve these slices to be inserted between the slices of the ham. 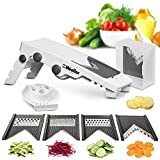 For the remaining apples, use the thicker setting on the mandoline. These slices will go on the bottom of the baking dish. Place the thick slices of apple on the bottom of a large baking dish. 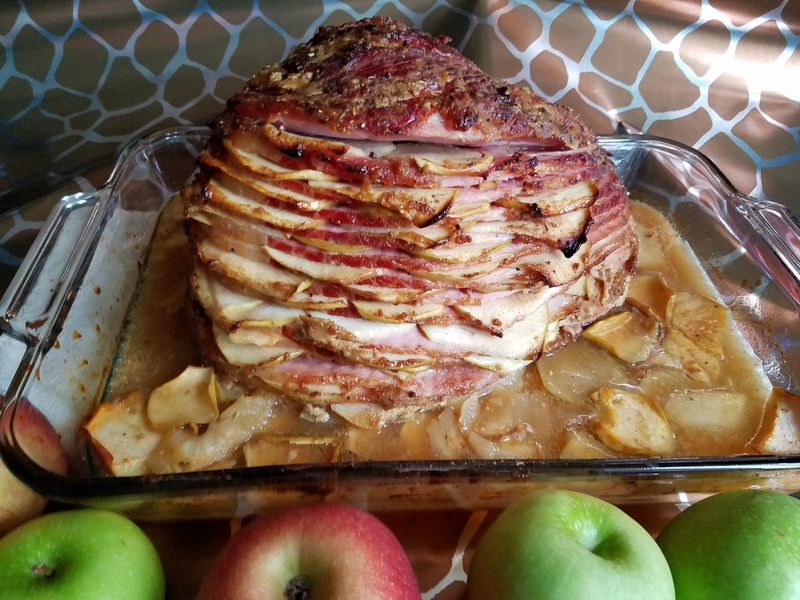 Place the ham on top of the apples, cut-side down. Add the thinly sliced apples between each slice of ham (usually 2-3 slices of apples will fit for each layer). In a bowl, mix the brown sugar and the apple pie spices mix together. Add the orange juice to the bottom of the baking dish. Make sure there is enough orange juice to cover the entire bottom of the dish. If not enough, add more orange juice. Bake 10 minutes for every pound of ham (for a 16 pound ham, that is 160 minutes). Let the ham bake for 1 hour. After the first hour, begin basting the ham using the juices at the bottom of the baking dish every 20 minutes until the ham is done. Remove ham from oven. Let cool for a few minutes before serving. When serving, use the apple gravy at the bottom of the baking dish to add a little oompf to your amazing ham.